January has been one of the coldest on recent record so far for North Florida. It won’t be long before we are talking Groundhog Day. Wonder if ole Punxsutawney Phil will be seeing double when if he sees his shadow? Hope he doesn’t see it at all and we have an early spring, sure could use one. Been seeing double myself lately. Every time I look at a bird lately I see two of them. 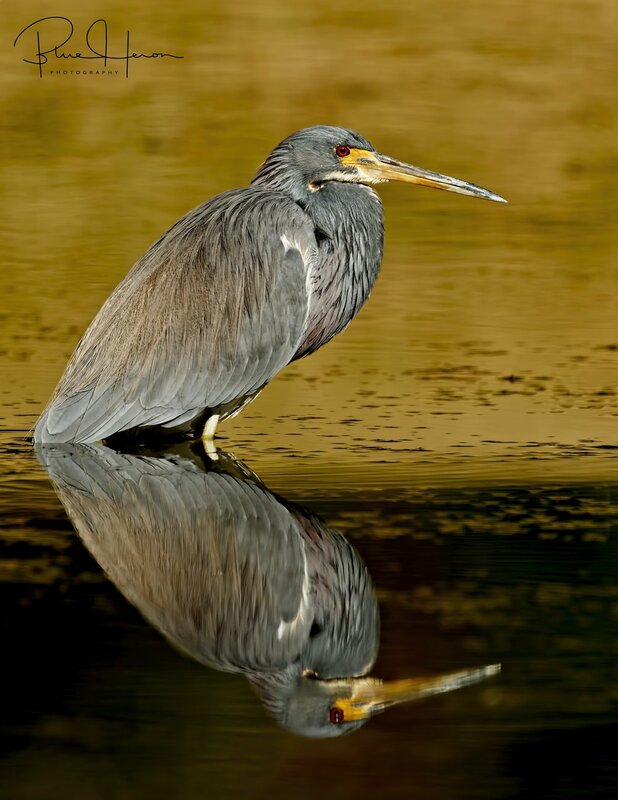 The Tricolored Heron was the spitting image of himself as was the Little Blue Heron, the Canada Geese, and the Hooded Mergansers. On top of seeing double, my distant vision seems to be going haywire. Might have to start wearing glasses now after 64 years without them. Having enough trouble trying to remember where the phone is, now I have to find my glasses. How come they call it a smart phone if it keeps getting lost? Are there two Tricolored Herons or one? 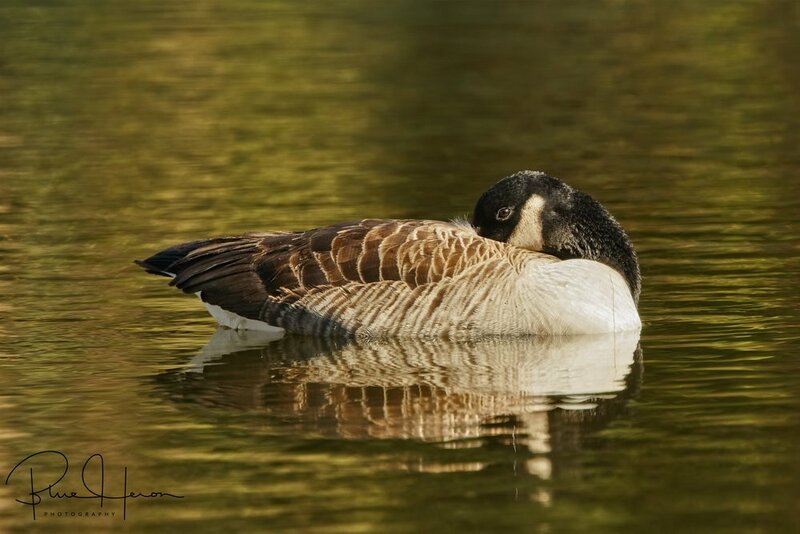 This double take filled the frame..
Another pair of Canada Geese.. Pair of male Hooded Mergansers? Is that a ghost I see? Or a pair of Little Blues? Sleepy time for both of us.. The shutdown is upon us. It has been a cold January for Florida so far but compared to up North we are doing fine. The heater has been repaired now so we should be ready for the next arctic blast. Got back from my recent sojourn and planning some more. 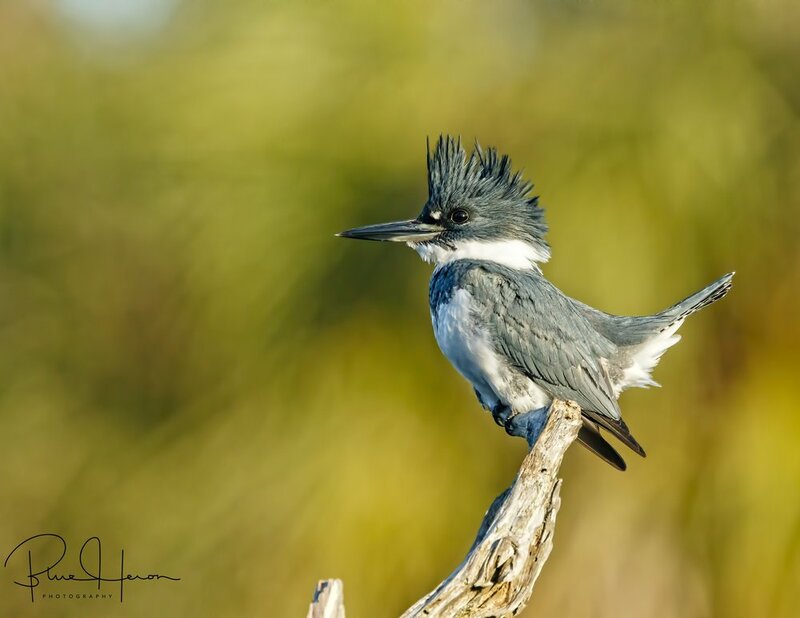 The Belted Kingfisher is well known in the bird photography community as one of the most difficult birds to capture because of their extreme skittish behavior around humans. There are several pair on the Broward but as soon as I step out the back door heading to the dock they sound the alarm and fly. The males are identified by the blue band under the neck while the females have a rufous colored “bra” across the belly. A friend in south Florida has been photographing Kingfishers from a blind using a perch over a local pond for about six years. I drove the 200 miles south to sit with him in some blinds before sunrise and waited for the bird to appear. We heard a familiar chitter as the Kingfisher announced its arrival and landed on the perch and began to hunt for minnows. Unfortunately, it was still predawn and there wasn’t sufficient light yet to get a good photo. The hungry Kingfisher ate about four minnows and left. The morning sun was getting swallowed up by some clouds coming in from the ocean as we waited hours for the bird to return. Finally, the Kingfisher appeared but was very skittish because of the local morning walkers going by with their dogs. I managed to capture only a few images as the sun briefly peeked out before the bird took off again. It returned after about two more hours only to be buzzed by another Kingfisher which scared it off the perch. In the interim a cute Eastern Phoebe paid us a visit. The suns reflection on the water painted a beautiful photo. Although I never got a chance to capture the Kingfisher diving for a minnow the whole trip was well worth the wait. As I headed homebound I determined to make a return trip to try again. Good things in life are indeed worth the wait. Too often we just don’t have the patience. Our Congress is a prime example. Take time and enjoy the little things when you can. Unlike our pathetic government, they are "always open" to us and It is worth it. Blessings. Belted Kingfisher, male. This skittish bird is difficult to capture..
An Eastern Phoebe landed on the perch too! 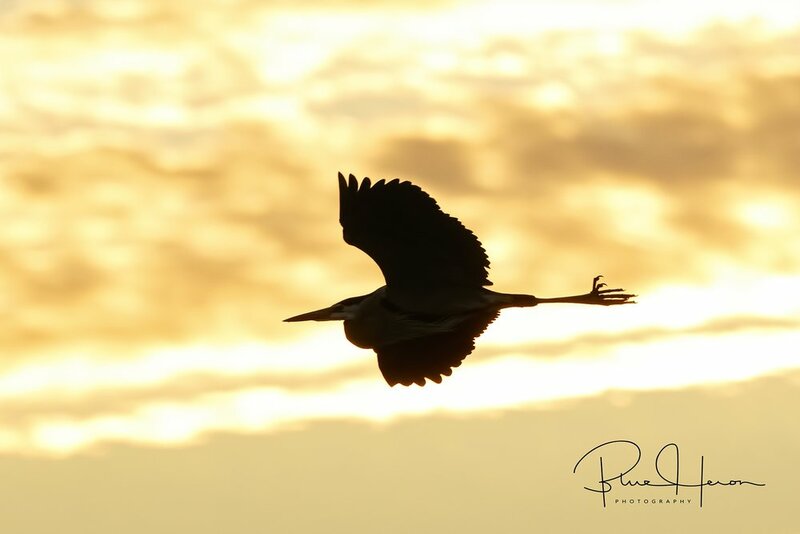 Don't wait too long to capture the joys of life or like this bird it will be gone! The sun was just beginning to paint the skyline a diffuse orange glow when I arrived at the Viera Wetlands about 0630 am. There were a few photographers already near the Great Blue Heron nest. I was informed I had just missed the morning handoff and stick ritual. Timing is everything. For the past few years I have chronicled stories of Gus and Greta, a Great Blue Heron couple at the Viera Wetlands. These two love birds were back again and already sitting on eggs on a freezing cold morning. I just missed Greta leaving. Gus now had the Daddy Duty. He sure looked cold against that backdrop of the crisp morning sky. A few other Great Blues were also doing their morning vigil waiting for the relative warmth of the sun. At just about 30 degrees, warmth is indeed relative. As the sun began to rise, so did Gus. He did his morning “routine” and carefully examined each egg. Hope they don’t freeze! After assuring himself all was well, Gus settled down carefully over the eggs to keep them incubated. In a few weeks, a new little Gus and/or Greta should greet the world. I will try to make it back when I hear they have hatched. 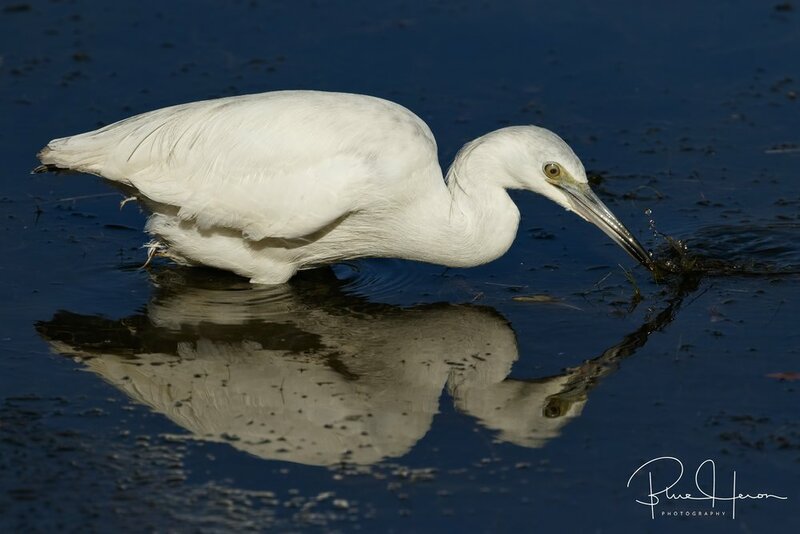 I captured some images of some other wetland sojourners. Several pair of Anhinga were also nesting in the palms near the Great Blue Heron nest. They too were taking turns sitting on the eggs. The male was still busy bringing sticks to the nest. 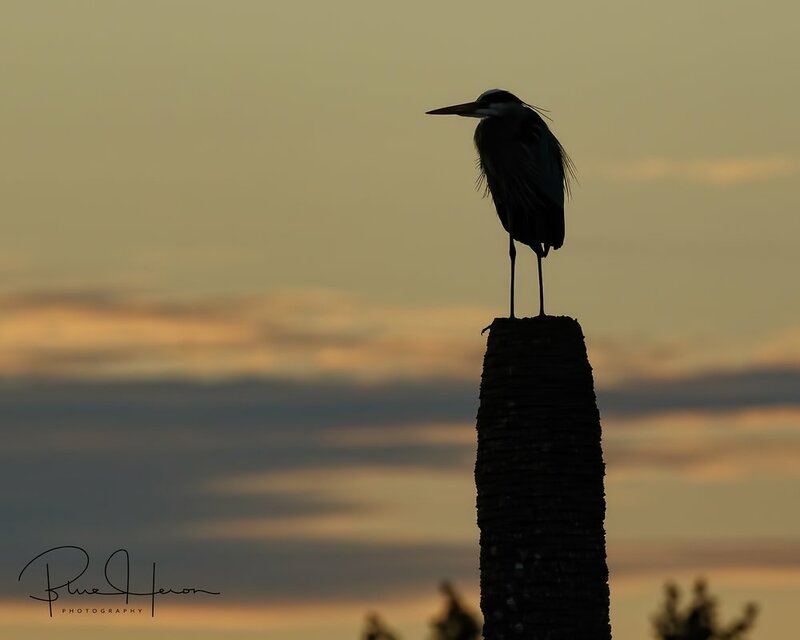 Another photographer said the Great Blue Herons kept taking their sticks. We watched as one Great Blue brought a stick to another nest and was allowed some morning delight time too. I later saw this other Great Blue (male) Heron land by my jeep and got some close up and personal photos which it did not seem too pleased about. The "look" it gave me put a chill up my already frozen spine. Gus the Great Blue Heron is up early and assumes the watch..
After carefully examine the eggs Gus sits down to incubate them. Daddy has the duty! A pair of immature Red-shouldered hawks were looking for easy picking too! 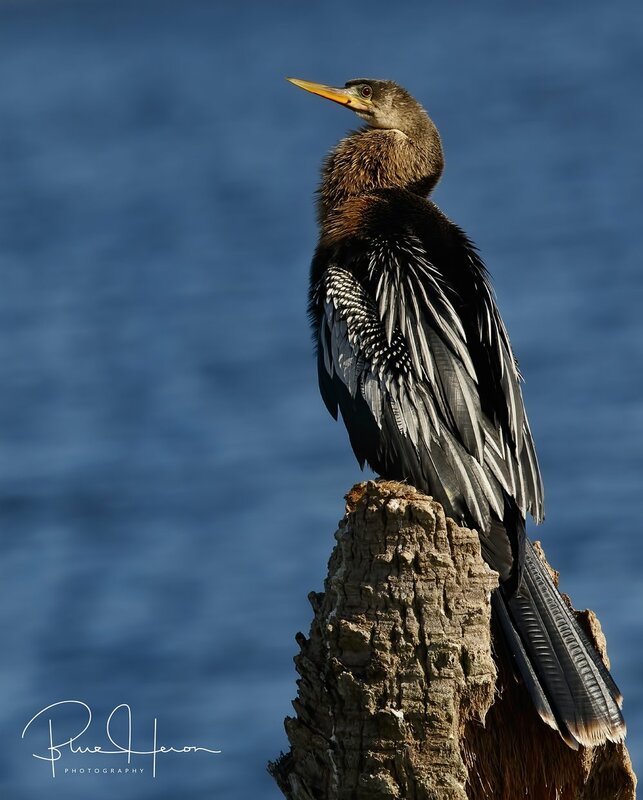 Male Anhinga returning to the nesting site.. 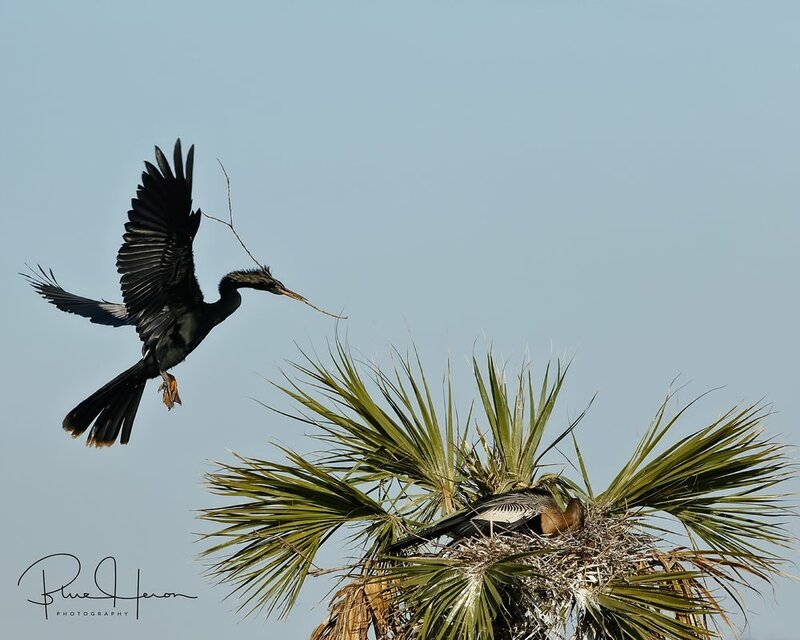 Male Anhinga brings another stick to the nest. I get "the Look"...do you remember your parents with this look too? The New Year began with an icy arctic blast of air. A gray blanket of stratiform clouds covers the sky. No sunshine today. 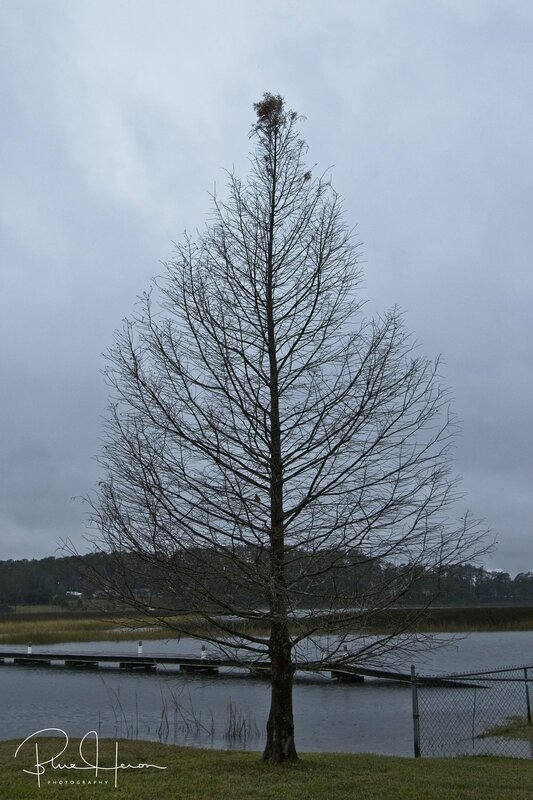 The General, our bald cyprus is bereft of nearly all foliage and bald indeed save for some new growth at the top. For us Floridians it was like a deep freeze event. I know my northern friends will just smile but snow and freezing temps with wind chill in the teens is extreme cold for us who live south of I-10. It has not stopped the marsh birds from frequenting the area though, sure is better than up north they say. A glance at the marsh presented an unusual scene. The prior’s days gathering of all the herons and egrets on the dock repeated itself. Only this time they were lining the bank all across our yard and the neighbors. Dozens of birds were just standing in a row patiently waiting for the tide to recede and for the merganser ducks to appear to stir up the minnows. Not wanting to disturb them, the Editor and I just observed from the warmth of the house. Unfortunately, this morning that warmth was gone as the heat pump crapped out during the night. Thankfully the gas fed fireplace was available. In the front yard, I had a veritable invasion. Dozens of juvenile Ibis (aka Florida chickens) were feeding contently in the winter weeds and grass. These brown mottled birds with their long proboscis beaks are comical to watch. I grabbed the doohickey and got down at eye level with them for some photo ops. They quickly grew tired of my presence and headed up the driveway to the neighbor’s yard. Each year at this time they seem to settle into our local neighborhood going from yard to yard in flocks of 20-50 young birds. You had better have a hat on when they fly overhead too. The "General", our bald cyprus in nearly bald indeed on this blustery winter morn. First it was Fake News,,,Now Fake Snowys...can you spot the imposter? A freezing immature Baltimore Oriole vacations in "Sunny Florida"
Red-Bellied Woodpecker in a brief period of sunshine.. 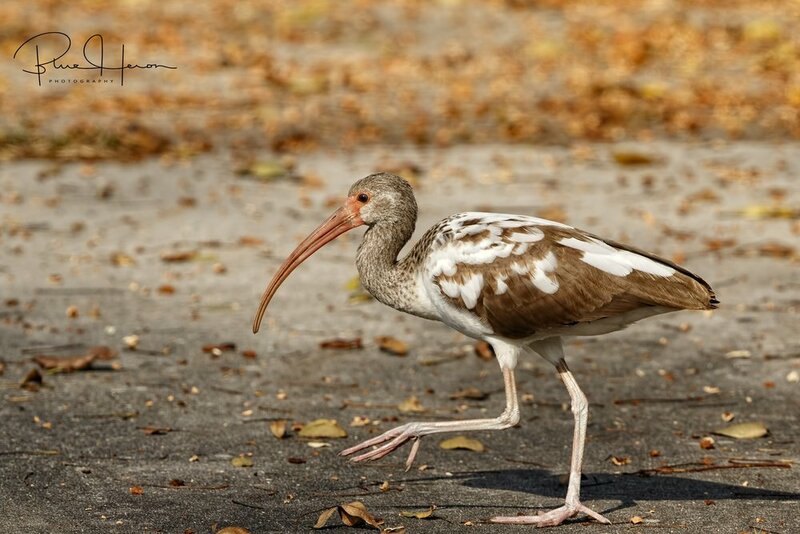 Upon reaching maturity the Ibis turn nearly all white with some black tips on the wings and have blue eyes. Back off Mr Doohickey or I will doo doo on your car! Happy New Year from Reflections. Hope you had a wonderful and safe New Years Eve celebration. The Editor and I struggled to stay awake to watch the ball drop again to bring in 2018 and by golly here it is already! The New Year is a time to look back and reflect for some, a time to look ahead and face the future for others, but for me, to focus only on today. Here on the Broward there was a gathering on the dock. The birds heard the President’s promise to “Drain the Swamp”. 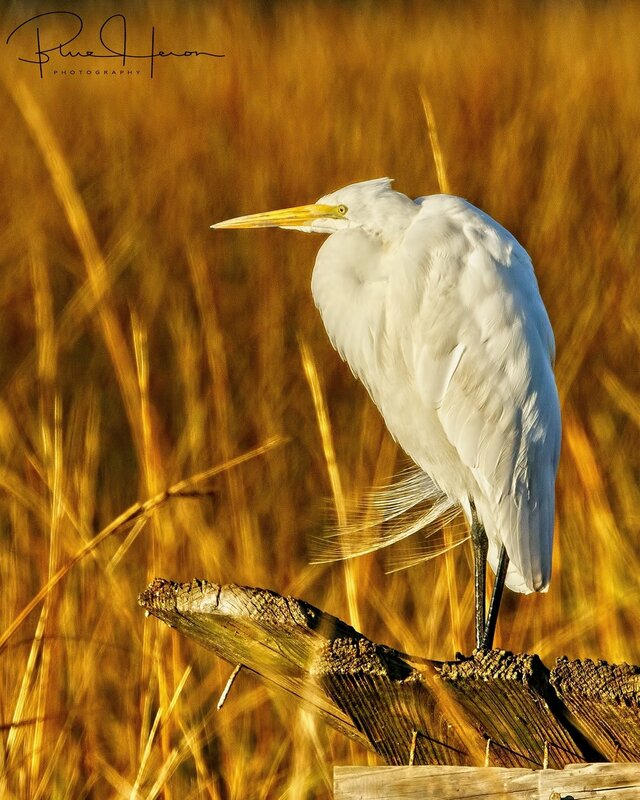 Snowy Egrets, Little Blue Herons and Tricolored Herons gathered by the dozens to see the swamp drain and feed on the bounty. Actually they were waiting for the tide to go out and for the Hooded Mergansers to come in diving and feeding to stir up the minnows. Then it was every bird for itself. You all know that a stork brings in the New Year’s baby. I think 2018 is going to be ugly because the Wood Stork that brought it in sure is. An Osprey landed in the neighbors yard with a fish. I grabbed the doohickey to try and capture a photo. Our (dumb) cat decided to have Osprey for breakfast and jumped the fence to capture it too. The Osprey was not impressed and flew off to enjoy its meal in peace. From the stern look on the Osprey, had I not been there, it may have grabbed the cat for breakfast instead. Old Man River the Great Blue Heron appears frozen in time.. The Birds of the Broward gather on the dock to see the swamp drained..
Low tide and the Hooded Mergansers stir up minnows for a New Years Eve feast! An Osprey landed in the yard with a fish snack..The cat spots the bird and gets a look..back off! The Osprey flies off to enjoy its snack in peace.. I am watching you cat...might have you for lunch next time! Happy New Year to all!